The following list describes the projects that electronics hobbies enthusiasts can put their knowledge of electronics into practical experience. The challenge is to get the materials and build the projects or simply by getting some closely related projects from off the shelves products. These projects will be useful for high school students, teachers, colleges and university students, hobbyist and electronics designers. All you need to know is some basic electronics, some know-how of soldering, component identification and the determination to learn. The testing can also be done by using a breadboard, a DC power supply, jumper wires and the components. Once the circuit is functional, you can then proceed to solder the parts onto the printed circuit strip board as prototype. If you want to go further, enter the circuit into a PCB design software and design the layout of the PCB using the schematic that you have designed. You will then need to etch the circuit board, drill the holes to mount the components and then soldering the parts into the board. Functional testing should always be done before you proceed to use the design. Try out and experiment with this circuit that will help to water your plants automatically. It uses an op-amp and 2 probes as its main components. This project will display the temperature of a room in Fahrenheit using 10 LEDs. The temperature range is from 62F to 80F. This circuit uses 555 Timer IC and light dependent resistance to trigger a relay when ambient is dark. Good to automatically turns on a lamp when the surrounding is dark. Construct and try out this door bell that uses 555 timer and a speaker as its main component to generate an audible sound when pressed. This circuit uses a timer circuit together with a binary counter 4020B to output an alarm when a specific time has been achieved. 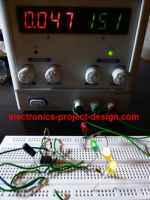 This Digital Dice electronic project uses a combination of 555 timer, 7490 decade counter, 7483 4-bit binary adder, 7447 BCD to 7 Segment Decoder in dispaying a random number on the seven segment display once a button is pressed and released. Construct a touch/contact switch using 4001 NOR Gates IC to turn ON and OFF a LED. This circuit will activate a lamp or LED for a few seconds once the touch terminal is touched. Build this dry cell or rechargable battery tester project that is able to determine the charge of the battery. The knowledge of using LM3914 is attained by building this project. This signal conditioning project will convert a sine wave signal to square wave signal.